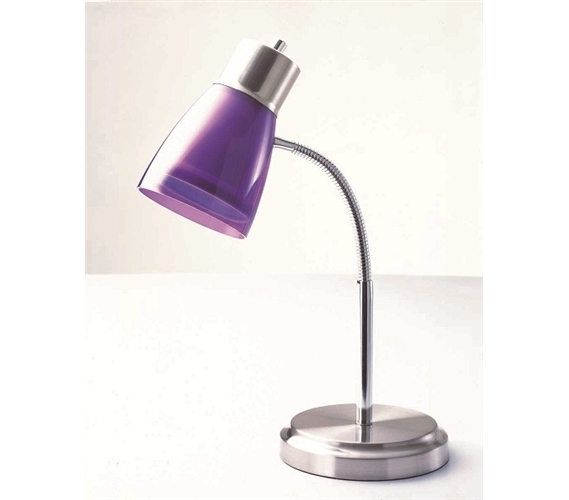 Including a desk lamp for college with your dorm stuff is a bright idea! Know why? Because you'll be doing plenty of studying and reading throughout college. This means that if you spend all that time in dim lighting, your eyes will be pretty worn out after four years. But by simply including a lamp for college like this Gooseneck College Desk Lamp - Purple as part of your college supplies, you'll be all set. Whether you're reading at your dorm desk or you place this lamp on your dresser next to your bed, the extra light will make reading easier. Even if you're just checking your email, keep sufficient lighting to make dorm life more convenient. By adding a dorm light, your college dorm itself will look better all around. While the purple color of this cheap lamp for college students already adds to your dorm decor, a well-lit dorm means you'll have better lighting on all your college decorations! Those cool posters and other dorm wall decorations will now be in the spotlight thanks to your college light! Sometimes, too, that overhead light can be too bright. When that's the case, turn it off and switch on this cool dorm item. It's practical and it looks cool. Plus, it's cheap! What more could you ask for in a college supply?